1. Disclosure to Third Parties:We will not disclose any personal information to any third party source at any time. All personal information is kept secure and never shared or sold to any third party. 2. Acquisition of Information: We do not acquire any more information about consumers than is required by law or otherwise necessary to provide a high level of customer service. 3. Our Employees and Privacy: We train all our employees about the importance of privacy and give access to information about consumers only to those employees who require it to perform their jobs. 4. Security Measures: We make access to privacy sensitive information subject to rigorous procedural controls, consistent with legal requirements and the demands of customer service. We use the highest levels of encryption available for all credit card transactions. 5. Transaction Server: We use external transaction and processing servers to ensure maximum credit card and personal information security. 6. Third-Party Web Beacons: We utilize Google Analytics to help analyze where visitors go and what they do while visiting our website. If you would like more information, see How Google uses data when you use our partners' sites or apps. We do not knowingly collect any Personal Information from children under 13. Where any such information is inadvertently collected, we will delete the information as soon as possible. If you believe a child under 13 has provided us with Personal Information, please contact us. General Information: When you visit our site, we may collect various categories of general non-personal information "General Information". General Information includes browser, operating system and device information, TCP-IP address and the date, time, length of stay and specific pages accessed during your visits. Like many ecommerce sites, we use IP addresses to help diagnose problems with our server to provide a better web experience for our valued customers. Your IP address is used to help identify you and your shopping cart. We may use your General Information and deidentified Personal Information to prepare anonymized, aggregated data about our users ("Anonymized Data"). We may provide third parties with Anonymized Data in describing our site to prospective partners, advertisers and other third parties, and for all other lawful purposes. As communicated to third parties, the Anonymized Data does not include any information permitting the recipient to identify, locate or contact you. 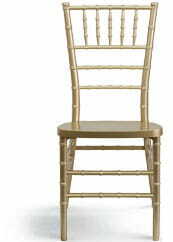 Best Chiavari Chairs employs other companies and individuals to perform functions, such as fulfilling orders, delivering packages, sending postal mail and e-mail, serving ads on our behalf, providing search results and links, and processing credit card payments. These third-party service providers have access to Personal Information needed to perform their functions but may not use it for any other purpose. California law permits individuals who provide Best Chiavari Chairs with Personal Information and who are California residents to request certain information regarding our disclosure of Personal Information to third parties for their direct marketing purposes. To request this information, please contact us. When you send or otherwise transmit your sensitive information (such as your credit card number) to or though BestChiavariChairs.com, your sensitive information is encrypted and protected with SSL, the current industry-standard encryption protocol. When you are on an SSL-protected page, a picture of a closed lock appears at the bottom or top of some web browsers. Another way to tell if you are on a secure page is to check the URL or address of the page. (Look in the address box or right-click on the page and select "Properties".) These secure SSL-encrypted pages have URLs that start with "https://" instead of "http://".